The Peregrine Falcon is a magnificent raptor and I was lucky to spot this bird of prey near Pretoria recently on a birding outing. It perched for quite a while on a branch in a dead Bluegum tree and then flew away very swiftly. 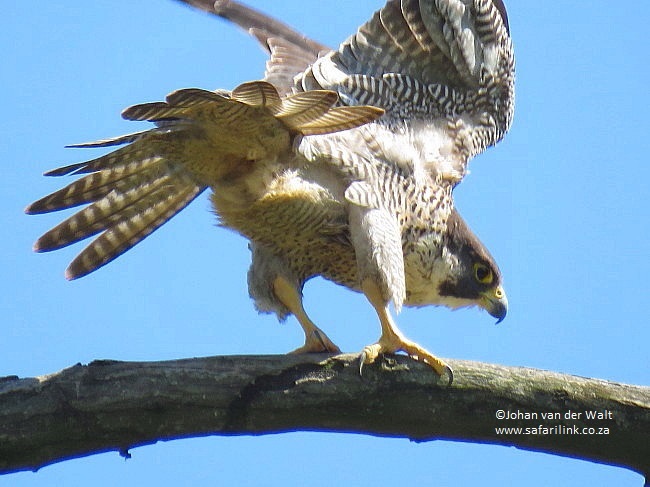 The Peregrine Falcon is known as the fastest bird and can reach a speed of about 320 km/h when hunting, especially with its high speed dive from high above just before striking a bird in flight.